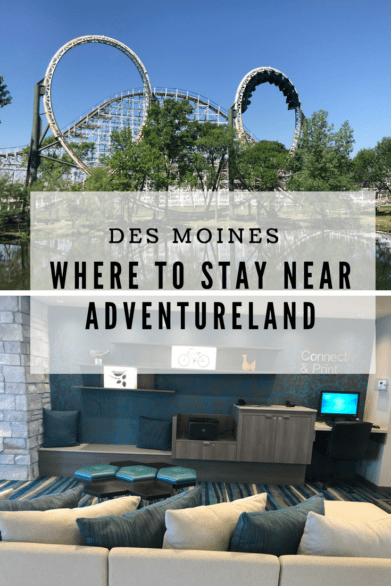 Our long weekend in Des Moines, Iowa this summer included a day at Adventureland. Since the theme park was the main reason we were making this trip, it made sense to stay at a place nearby like Fairfield Inn & Suites. 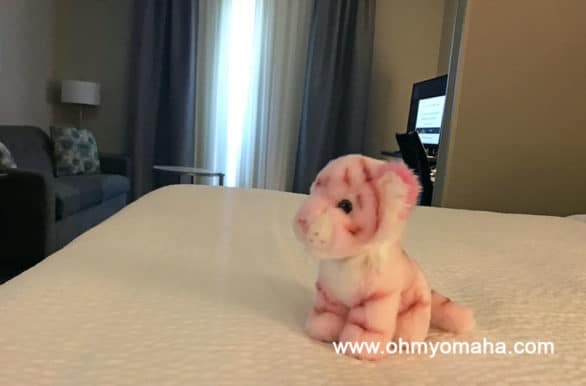 If you’re looking for a hotel near Adventureland, here’s what our stay was like. 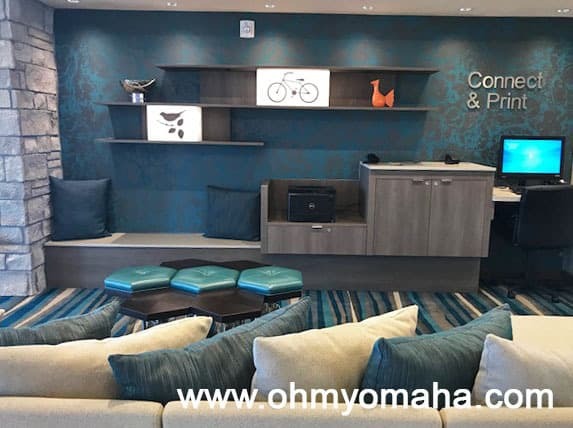 Disclosure: Our weekend in Des Moines was hosted by Catch Des Moines. All thoughts, opinions and typos are my own. 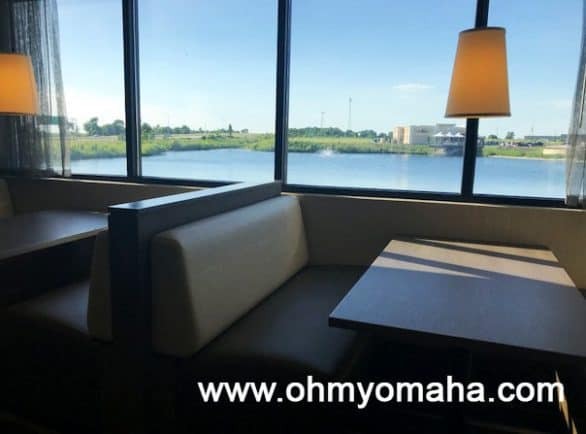 This Fairfield Inn & Suites is technically in Altoona, Iowa, but simplicity’s sake, we’ll say it’s in Des Moines, since most of us out-of-towners think Adventureland is in Des Moines. The important thing is that it’s super close to Adventureland, right? If you’ve stayed at a Fairfield Inn & Suites before, you are familiar with this Marriott brand hotel. It’s comfy and family-friendly and affordable. The bonus with this particular location is that it’s new, so everything is pristine and fresh. The lobby of the Fairfield Inn and Suite near Adventureland. The amenities I expect from a Fairfield are consistent the Marriott brand line of hotels: Complimentary hot breakfast, comfortable beds, small pool, and a hip, modern-looking lobby. This location also had a hot tub and a lake view. There’s an outdoor patio by the lake that will be nice eventually, but since this is such a new hotel, there still is some landscaping to do. There’s a door to the patio from the pool area. This hotel had a nice touch for those who’ve spent a day outdoors in the summer: Cucumber-infused ice water in the lobby. If you’ve sweated your way through Adventureland in June, this is a refreshing and pleasant surprise to arrive to. As a parent, I liked the convenience of walking down to the lobby for a hot breakfast, as well as having a variety of food to choose from. Fresh fruit is always a welcomed option at these breakfasts. The view from the dining area in the Fairfield Inn & Suites. I also liked the proximity to Adventureland. It wasn’t as near our other destinations that weekend, like Blank Park Zoo or downtown Des Moines, though. We’ve stayed at a hotel in West Des Moines on our last visit, and if you know the area, that’s even further from Adventureland. Anyway, after a long day at Adventureland, it was great to drive just about a mile to get back to our room. The rooms themselves are great for families, spacious enough for a family of four. We had two queen beds, plus a pull-out couch. The “suite” area of the room consisted of that couch, plus a desk and TV. This is what happens when your 6-year-old art directs the photo of a hotel room. You can see the suite area with the pull-out bed couch in the background. There’s a small toiletry and snack store located in the lobby, in case you forgot necessities. I opted to head to the nearby Target, though, for things I had forgotten. As usual, the pool was the biggest hit with the kids. It’s not very deep, so it was good for my little ones. The hot tub was their second favorite area. The Fairfield Inn & Suites is in a new commercial development in Altoona. 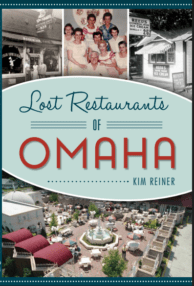 It includes the Outlets of Des Moines and the Bass Pro Shop, plus a few restaurants. You could feasibly walk to all of them, but we did not. It looked like there could be a walking path constructed down the road, connecting the hotel to the nearest restaurant, Johnny’s Italian Steakhouse. 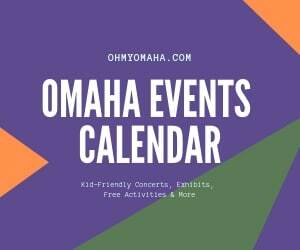 If you’re wondering about nearby restaurants, I was more satisfied with the variety and unique dining experiences in downtown Des Moines. The restaurants closest to this hotel are all chains, which may or may not be what you’re looking for. We tried to go to Johnny’s Italian Steakhouse one night since they had provided some coupons to hotel guests, but the wait was too long for our kids to stand patiently.